Dr. William Keegan is Curator of Anthropology, Department of Natural History, Florida Museum of Natural History and Professor of Anthropology and Curator of Latin American Studies at the University of Florida. He is also affiliate faculty in the College of Natural Resources and the Environment. 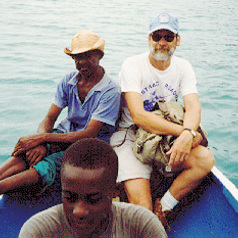 He has directed archaeological research in the Caribbean for the past 40 years. He received his Ph.D. in 1985 from the University of California, Los Angeles. Following the completion of his Ph.D. he was the Visiting Scholar in North American Prehistory at Southern Illinois University. He was Assistant Professor of Anthropology at the University of South Carolina before moving to the Florida Museum of Natural History in 1987 to develop a research-based program in Caribbean Archaeology. He Department Chair from 1994 to 1998, and Associate Director from 1998 to 2000. He is the author of five books on Caribbean archaeology, and has edited five others. His latest is The Caribbean before Columbus (with Corinne Hofman) which will be published in January 2017 by Oxford University Press.